The Gate CFValve™ is designed to provide a constant rate of fluid flow at a preset pressure when coupled with a down-stream orifice. Once the threshold operating pressure is reached, the fluid rate remains constant regardless of the input pressure. Should the input pressure fall below the threshold pressure, the CFValve™ will close and shut off the fluid flow. The CFValve™ is non-adjustable and is available with operating pressures, up to 100psi, in three body sizes. At rest, the Gate CFValve's™ diaphragm is held against the sealing ring, effectively closing the CFValve™. The fluid enters the inlet side of the CFValve™ and flows around the metering pin. The CFValve™ remains in the closed position until there is sufficient pressure to overcome the spring force. As the inlet pressure increases, the diaphragm retracts, moving the metering pin, which then throttles the fluid flow through the valve body. 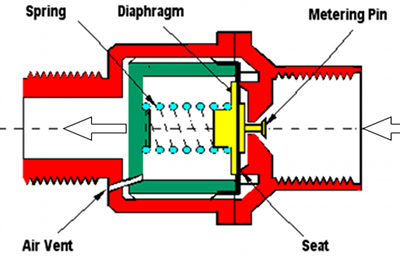 Under conditions where the input pressure varies, the spring modulates the diaphragm and pin assembly, reducing or increasing the input orifice area, thereby controlling the fluid flow. A Southern California Pest Company fit its fleet with Gate MMOD™ Triple AI systems, allowing for the On-Demand-Mixing of any combination of three active ingredients with precision application rates and constant visual verification. Through the use of the Gate MMOD™ the pest trucks can now easily customize spraying for each customer, utilizing organic and/or traditional materials targeted for each job at the exact proscribed application rate. By avoiding premixing into tanks, batch mixing at the warehouse and/or mixing by operators in the field, chemical use is reduced – no waste, disposal or risk of spill – and an accurate application is ensured and utilized every time.